Two weekends ago, while working with a group at Peterskill, I took a look around at the top of the cliff. More specifically, I was interested in the anchors people were building and using for toproping. Peterskill has become a popular spot for toproping and many recreational and guided groups enjoy the pretty wooded setting and classic Gunks climbing this spot offers. Toprope anchors need to be strong. Strong anchors are built from unquestionably good components. Usually there are two or more components, and if the anchor is a gear anchor it's customary to use three or more pieces of gear. Two piece gear anchors can be acceptable but generally lack the strength of a three-piece anchor. Then, these strong components are attached to each other in a manner that allows the load to be shared among all components. Anchors built for a group (more than a party of two that will each take one lap) also need to be durable. We call the repeated loading and unloading seen in a group toprope environment “cyclic loading”. This cyclic loading causes all the materials in our safety system to stretch. As the material, which is generally out of sight to the climbers on the ground, stretches and rubs over an edge repeatedly it can become abraded. In extreme examples anchor materials or climbing ropes have been almost entirely cut or abraded as they rub over edges during the course of a single climbing session. Using durable materials (static rope or 1” webbing are the standard) and wisely choosing anchor locations will prevent material wear. It's nice to also have redundancy in our anchors. Multiple components are attached to a masterpoint isolated by a knot with multiple loops. Two carabiners are attached to the masterpoint, and the climbing rope runs through these carabiners. Hopefully this loop is over the edge so that the rope runs freely and with a minimal amount of friction caused by the edge at the top of the cliff. Strong, durable and redundant anchors can also be neat and easy to inspect. Just because there are multiple components doesn't mean we can't quickly look over an anchor and say “this one looks good”. If you're incorporating all of these concepts into your anchor there's a good chance your anchor is safe for climbing. If you can't quickly look at your climbing anchor and determine that your anchor contains all of the things I've laid out above it might be time to practice building good, solid climbing anchors. On this particular day at Peterskill, the majority of the anchors I looked at were unsatisfactory. Two separate recreational groups were climbing in the area, and they built three anchors at the top of the cliff. A guide from our group helped one of the recreational groups rework one of their anchors. This anchor looked fine. The other two were “strong enough”. Strong enough and unquestionably strong are very different things in my mind. I save “strong enough” for alpine belays in the mountains, where I might consider the risk of a fall to be quite minimal. Toprope anchors need to be unquestionably strong and durable, and there's no doubt these anchors could have been better. So, let's have a look at these anchors and determine what's good and bad about them. The Bad - The numbers on the image above correspond to the numbered list below. The purple cam is in a shallow flared placement and is not tightly cammed. A quick visual inspection of fracture lines and a tap on the block below the cam reveals that this block is detached. Given the equalization configuration this poor piece receives about 50% of the load. The masterpoint is not redundant. Adding an additional sling and an additional carabiner at the masterpoint would create redundancy. Considering you can't see this anchor from below and that it rubs over the edge this setup would have me feeling edgy. This anchor is a mess. It will be hard to evaluate it for wear/integrity throughout the day. This anchor makes me nervous. Fully half the load rests on one bad piece of gear placed in a loose block. Thankfully, rock quality in the Gunks is very good. The lack of redundancy in an anchor that's going to be loaded over an edge all day long is a serious issue here too. Additionally, the anchor is a messy conglomeration of materials that makes evaluation impossible. Were I to build an anchor here I would probably choose cracks further away from the edge, incorporate the tree and use 9-11mm static rope to tie everything together. This anchor is strong. Both bolts, which are new, stainless and properly placed are about 25 kN strong. The lack of slings extending this anchor are going to increase the load on the bolts and place undue wear on the rope. Climbing ropes run smoothly, and kink-free, when they run in a planar motion perpendicular to the plane of the carabiner. When we use slings to bring the attachment points on this anchor together the rope is going to run smoothly. 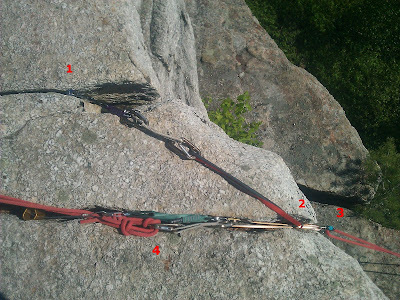 In this example the rope runs through each anchor carabiner at an extreme angle. This can cause severe kinking, and I wouldn't be the least bit surprised to find this group was dealing with a messy rope on the ground by the end of the day. 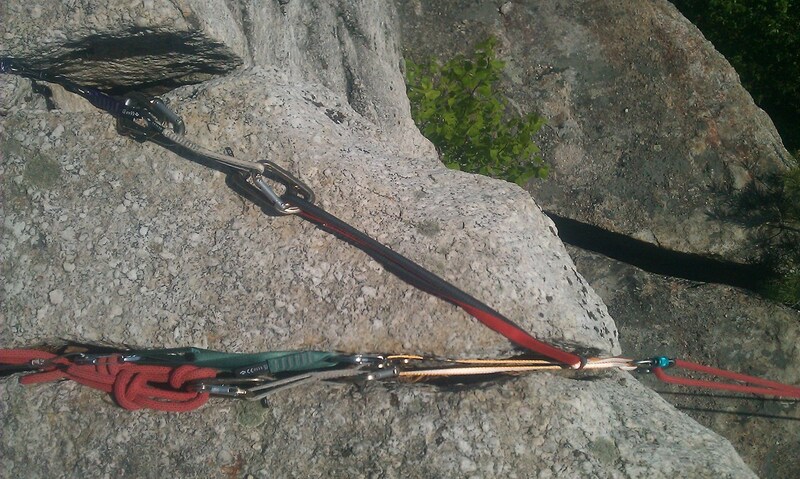 This anchor is plenty strong but needs slings or a cordalette so that the two attachment carabiners are side by side. 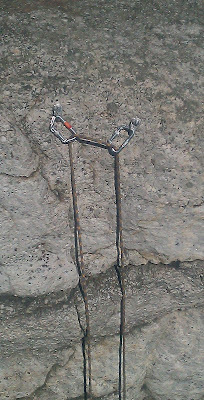 This setup, while strong enough, demonstrates a complete lack of understanding about how we build climbing anchors outdoors. 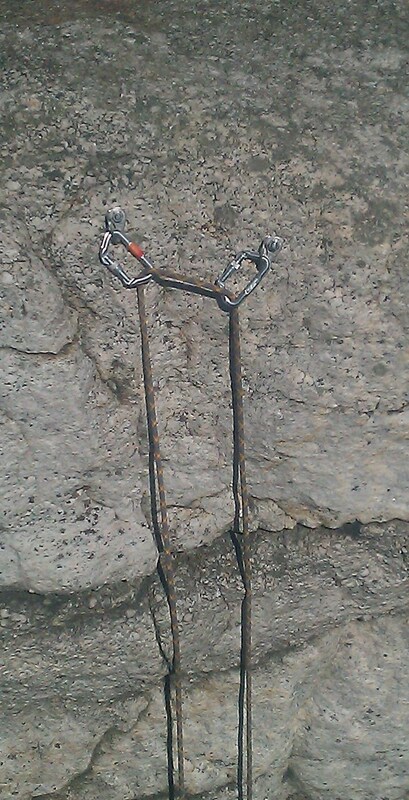 When the majority of anchors I view in any given location are unsatisfactory I worry about climber safety. It's common for groups to "share" ropes which exposes even more people to these less than satisfactory anchors. As I stated in my earlier "Saturday Night Live" post I think the number of anchor/gear failure accidents are going to increase over the coming seasons. The best way to combat this is by learning how to build good anchors. If you recognize these anchors as your own contact me. I'll be glad to give you a free lesson on gear placement and good anchor building techniques.